The W6 Class tram prior to restoration work. Credit: Bendigo Heritage Attractions. 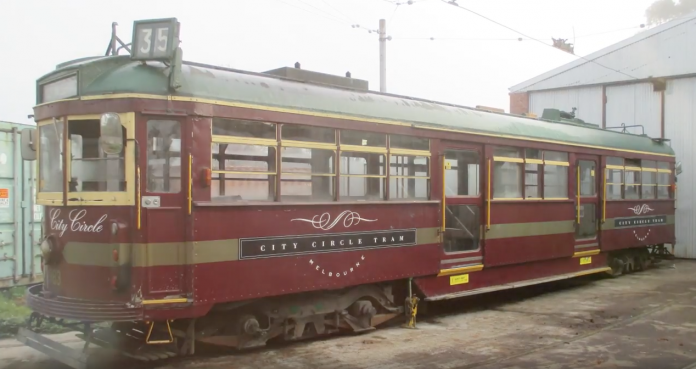 An historic tram built in the 1950s has re-entered service on Melbourne’s City Circle tram network in Australia. Tram 983 is a W6 Class tram and is the sixth to be restored to a W8 configuration. It was built between 1951 and 1955 by the Melbourne and Metropolitan Tramways Board and is one of 30 W6 trams. It is a bogie, drop-centre saloon-type tram, with a capacity to seat around 52 passengers. These trams were built for use predominantly on the Bourke Street cable lines, where trams replaced buses from 1955. Following the introduction of Z series trams in 1975, the W6 class trams were used more widely throughout the network. Later on they were gradually withdrawn as B2 class trams entered service. The City Circle service around Melbourne – a free tourist tram – is now the only service where W Class trams are used. The Bendigo Tramways workshop – in partnership with operator Yarra Trams – restores the W Class trams to bring them up to a modern and safe operating standard, without losing the tram’s historic feel. Bendigo Tramways said that Tram 983 underwent a full chassis rebuild with the manufacture and implantation of new drivers cabs, designed to help protect the driver in the instance of a crash. It was then rebuilt from the ground up, except for the roof which is repaired in-situ while still being supported by original upright structural supports. The tram is fully rewired and has new modern operating equipment and pneumatic and mechanical systems to help ensure that fits within the modern operating standards. The tram’s interior is a combination of old and new materials, with a focus on retaining as much of the original timber work, for example, as possible. The tram was painted with the original green and cream livery and then tested and commissioned before it re-entered service as a W8 City Circle tram. Didn’t these have just wooden seats, i.e. no upholstery or padding? Or maybe it was the suburban trains, but I have memories of a very hard ride!